Twenty four pros for $1.2MM on September 11 at Ontario or the Street League Skateboarding™ DC pro tour fueld by Monster Energy tickets on sale now. LOS ANGELES, CA (June 15, 2010) – Street League Skateboarding™ announced today that tickets are now on sale for the first-ever professional league for street skateboarding. A total of twenty-four of the best-known professional street skateboarders have signed multi-year contracts to compete exclusively in Street League™ - a series created by Rob Dyrdek, long time professional skateboarder, TV personality, and entrepreneur. The inaugural year of Street League™ features a 3-stop arena tour beginning at Jobing.com Arena in Glendale, Arizona on August 28th, Citizens Business Bank Arena in Ontario, California on September 11th, and the final stop in Las Vegas at the Thomas & Mack Center on September 25th. The Street League™ pros are competing in the DC Pro Tour fueled by Monster Energy for $1.2 MM in prize money – a larger prize purse than all other street skating prize purses combined. Using real time scoring and an exciting proprietary competition format, Street League™ will tell a compelling story about each skateboarder’s performance and will have fans on the edge of their seats from the first trick to the very last. 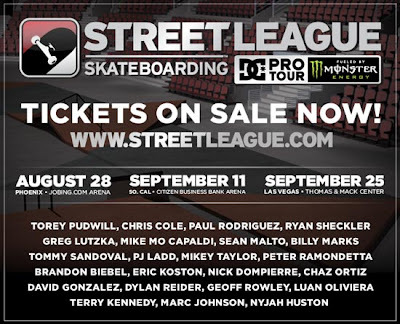 For more information and tickets sales please visit www.streetleague.com.